AMC has announced the return of Mad Men. The final seven episodes will begin airing Sunday, April 5th, at 10pm. PASADENA, CA – January 10, 2015 – AMC’s Emmy® and Golden Globe® Award-winning drama “Mad Men” kicks off its final seven episodes on Sunday, April 5 at 10:00PM ET/PT. Created by Emmy® Award winner Matthew Weiner and produced by Lionsgate, “Mad Men’s” highly anticipated series conclusion will, for the last time, follow the complex lives of Don, Peggy, Roger, Joan, Betty and Pete, and their families, colleagues, rivals and love interests, as their stories come to an end. Golden Globe® Award winner for Best Actor – Television Series Drama, Jon Hamm leads an Unforgettable ensemble cast, including January Jones, Vincent Kartheiser, Elisabeth Moss, Christina Hendricks, John Slattery, Aaron Staton, Rich Sommer, Christopher Stanley, Jessica Paré, Jay R. Ferguson, Kevin Rahm, Kiernan Shipka and Mason Vale Cotton. “Mad Men” has earned seven Emmy® Award nominations for Outstanding Drama Series, leading to four wins; three Golden Globe® Awards for Best Television Drama Series; a Peabody Award; three Producers Guild Awards; four Writers Guild Awards; two BAFTA Awards; five Television Critics Association Awards, including Program of the Year; and for seven consecutive years has been named one of AFI’s Top 10 Outstanding Television Programs. 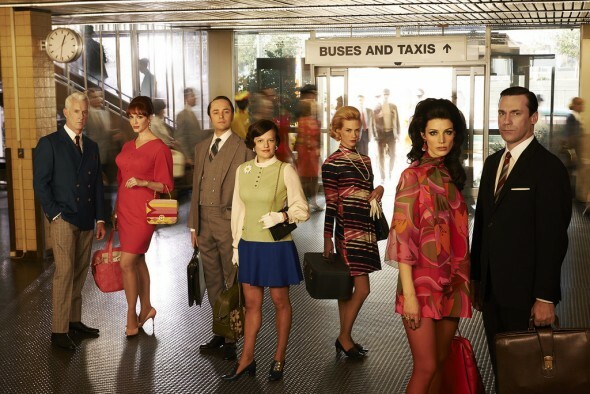 “Mad Men” is produced by Lionsgate, in association with AMC. Joining Weiner are executive producers Scott Hornbacher and Janet Leahy; co-executive producer Semi Chellas; supervising producer Erin Levy; producers Jon Hamm, Blake McCormick and Tom Smuts; consulting producers Lisa Albert and Robert Towne; and co-producers Josh Weltman, Bob Levinson and Marcy Patterson. Chris Manley, ASC is director of photography. Emmy® Award winner Dan Bishop is production designer and Emmy® Award winner Janie Bryant is costume designer. Christopher Gay, Tom Wilson and Chris Figler are editors. Fans looking to catch up on “Mad Men” can set their DVR every Sunday morning beginning at 6:00am ET/PT. For a full schedule of the Sunday morning marathon, visit http://www.amctv.com/. What do you think? Are you looking forward to the final episodes of Mad Men? Can’t wait to see how it all ends.